While the Sun Giant EP and self-titled album generally caught everyone off-guard with newfound baroque, minstrel pop stylings of woven harmonies and rhythmic acoustic pluckings, three years later everyone knew what to expect from Helplessness Blues. 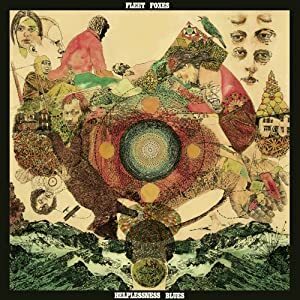 As my most anticipated album of 2011, I was itching for new Fleet Foxes, due in no small part to listening to any and all Fleet Foxes on repeat throughout the California Bar prep period. The group bring a big(ger) sound on many of the tracks with more prominent instrumentation accompanying the formally vocally-centric emphasis. The group still maintains that coming-of-Spring feel, which is what fans have come to know and appreciate, reveling in the free-spirited harmonizations and frolicky folkiness that makes the album, and their corresponding live shows, stand tall above the current indie folk noise. It is a complete album, running a range of tones, with "Battery Kinzie" providing drum-driven, soaring vocal harmonies, "Montezuma" for melancholic movements, "Helplessness Blues" for the single-structured, catchy chorus; however, for my money, it is the strummy, pace-changing "The Shrine / An Argument" that embodies what I love about Fleet Foxes... multiple melodies and moods in one song. Excellent from beginning to end, this effort fills a much needed void in my personal collection — some songs to whistle to, sing-along to, stum to, or (even) wave your hands in the air like a symphony conductor to, this album takes hold and only lets go at the final, wavering notes. Credit to Nesto for his insightful comments. This is definitely one of my favorite albums this year.